Scuba diving is among the best in the world, despite (or because!) the cold Atlantic conditions. 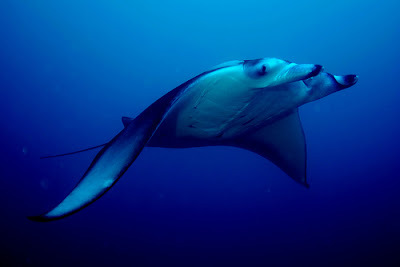 Yet, the Azores are rated as the new discovery in the diving business. Most diving locations guarante an encounter with the big fishes of the Atlantic and offer spectacular lava formations. We frequently observe large schools of makreles (e.g. Trachinotus ovatus, Trachurus picturatus), barakudas (Sphyraena viridensis), yellow-fin tuna (Thunnus albacares) and trigger fish (Balister carolinensis). Common sting rays (Taeniura grabata) grow to an enormous size in these waters and even spectacular encounters with large mantas (Manta birostris) are not uncommon. The underwater scenery alters between basaltic rock formations with canyons and caves and open sand flats. Each little cave or rock can be home to a variety of large and small marine animals, such as moray eels, octupus, lobster, spiral tube worms, sea urchins and sea spiders. Night diving is spectacular and amazingly easy at selected sheltered spots along the coast. During night dives we can see the dazzling colours of hugh swarms of small shrimps, as well as nudibranchs, Alicia mirabilis anemonees, and, depending on the time of the year, also biolumines-cent plankton (causing the so-called ocean glow). Make sure your travel insurance covers such activities as scuba diving. Some carriers consider sports like diving as extreme sports, and as the risk of injury/accident is higher requires special coverage. Adventure Travel insurance is a little more expensive, but should an accident occur, "normal" travel insurance probably will not reimburse your medical bills.